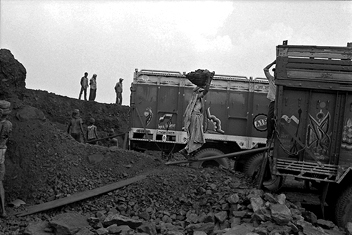 In Bihar and Orissa, one of the poorest counties of India, men and women hardly work under a scorching sun to load coal they extract from the bowels of the earth. The coalmines, left by the British in the 60', have started a long time ago to transform the landscape and the agricultural way of life its people. Toxic gases released in the atmosphere by the coal fires sparked below the surface of the ground are poisoning the life of the people. In each piece of earth, in each breath a fine black dust threaten their normal existence. In these lands nothing is normal anymore. Yet the people have learnt to live with the sooty bleak dust that veil everything like a shroud.